It has become a reality!! 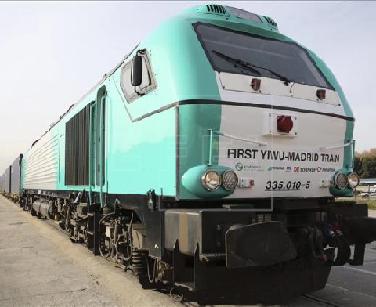 The first freight train between China and Spain, resulting from the commitment made by the Chinese and Spanish governments in order to promote trade relations between the two countries, has already successfully made its first round trip. The called Yixinou route the longest in the world, goes through more than 13,000 km crossing two continents and eight countries. Bringing the small Chinese consumption goods to Spain because thanks to this service the Spanish capital will be directly connected with the city of Yiwu, close to cities such as Shanghai and Shangzo. This is known as the largest wholesale center in the world. Getting Spanish products (mostly food) directly to China as they have a growing acceptance and demand in this big Asian market. For now this connection is being tested but actually the goal is to get regular monthly shipments. How was the first trip? In the first test trip, the train left from Yiwu on November 18, 2014, covering 13,052 kilometers containing 1,400 tons of domestic consumption goods and products for the Christmas market. During its tour, the convoy made changes of locomotive approximately every 800 km. And in Belarus and Kazakhstan it had to transfer the goods due to the existence of different rail gauges. Finally, the train reached Abroñigal station at Madrid on 9 December, after 21 days across eight countries: China, Kazakhstan, Russia, Belarus, Poland, Germany, France and Spain. And in time for distributing the products for the Christmas season. The second train of goods of the Yixinou (Yiwu acronym) route left from Madrid on January 29 with 64 containers loaded mainly with wine, olive oil, sparkling mineral water and iberian hams. It reached the West Yiwu Station on February 22 after 24 days of travelling, three more days than the first trip due to strikes in Germany. To this must be added the delay of waiting for special containers with heating equipment, necessary due to the low temperatures of the areas through which the train passes and to the features of the wine. At this point, we want to emphasize that this is only the opinion of the VIPEX Consulting team. Comparing the different means of transport in international trade, and if we consider that the sea freight has the 80% of the uses and that railway transport imply some specific regulatory issues, it seems that the train is disadvantaged. In its favour, we can say that railway transport is economically much more profitable than air. And in terms of speed, the train is probably much faster and safer than maritime transport, making it a very attractive alternative especially for shipping perishable products. The company goal is to make the journey in 18 days.